Having lived in Italy for many years, I would argue that the Italian dinner style is better for your health. I really enjoyed how every neighbor produced something, cheese, wine, olive oil, vegetables, Prosciutto. Italian cuisine is based on how far you can walk for an ingredient, it is truly local. My favorite part is how those neighbors get together and celebrate the fruits of the land with a fervor. No matter how long your table there will be someone of interest to fill that seat. I am not sure what reduces the risks of heart attack more, olive oil or vibrant dinner conversation. I enjoy a locally grown Mediterranean diet and try to share it with as many friends and neighbors as possible. 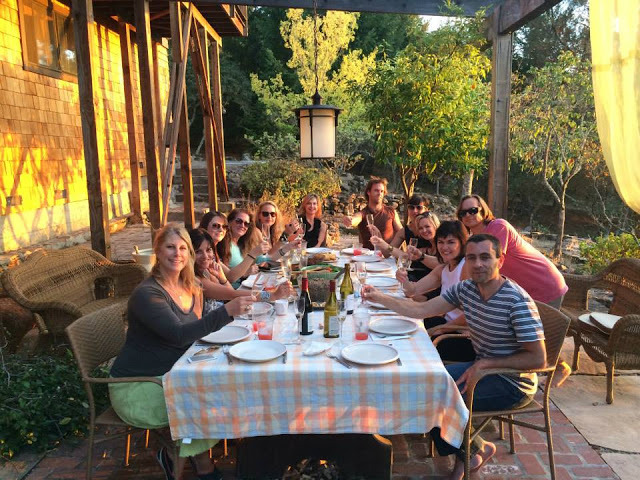 So if you want to cool the planet consider a long table, a bigger garden, and some friends to share the bounty. Lots of different vegetables and pates can serve as bruschetta but my favorite is garden tomato and basil. Raw to enjoy immediately. Pesto can enliven many different foods so I make a lot in the summer and keep it on hand frozen in covered ice cube trays. 1 1/2 cup potatoes cut to about 1 in. Pick, wash and De-stem Basil. I chop it before I put in mortar or blender. Put basil in a mortar with garlic, Romano cheese, pine nuts, parsley, and salt. Pound until smooth, then add olive oil and mix until smooth. Or, whirl all ingredients in a blender. Leftovers I store in Ice cube trace in the freezer they are the perfect size for a serving or to add a special zest to many dishes. 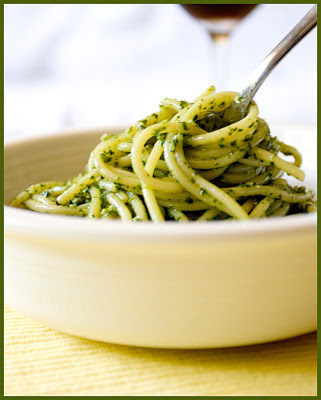 Delicious on pasta, spread on Bruschetta, or a dollop of gazpacho or sauteed Brussels sprouts. I freeze batches in ice cube trays so that I can use it in the winter when the basil is out of season. I would argue that the Italian dinner style is better for your health. Having lived in Italy for many years I really enjoyed how every neighbor produced something, cheese, wine, olive oil, vegetables, Prosciutto. Italian cuisine is literally based on how far you can walk for an ingredient, it is truly local. My favorite part is how those neighbors get together and celebrate the fruits of the land with a fervor. No matter how long your table there will be someone of interest to fill that seat. I am not sure what reduces the risks of heart attack more, olive oil or vibrant dinner conversation. For safety I enjoy a locally grown Mediterranean diet and try to share it with as many friends and neighbors as possible. So if you want to cool the planet consider a long table, a bigger garden and some friends to share the bounty. 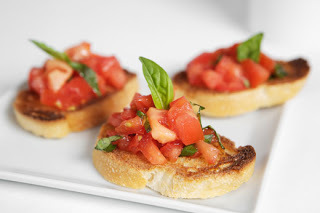 Lots of different vegetables and pate's can serve as bruschetta but my favorite is garden tomato and basil. Raw to enjoy immediately. Leftovers I store in Ice cube trace in freezer they are the perfect size for a serving or to add a special zest to many dishes. Delicious on past, spread on Bruschetta, or a dollop in gazpacho or sauteed Brussels sprouts.